Fahed Hamak, K. (2013). Synthesis,Characterization, Biological Evaluation and anti corrosion activity of some new bis-piperidone Derivatives. International Journal of Advanced Biological and Biomedical Research, 1(2), 186-196. Kholoud Fahed Hamak. "Synthesis,Characterization, Biological Evaluation and anti corrosion activity of some new bis-piperidone Derivatives". 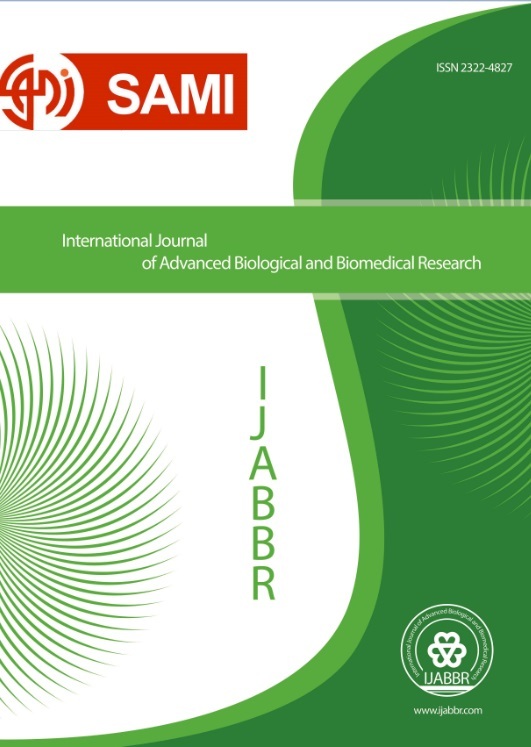 International Journal of Advanced Biological and Biomedical Research, 1, 2, 2013, 186-196. Fahed Hamak, K. (2013). 'Synthesis,Characterization, Biological Evaluation and anti corrosion activity of some new bis-piperidone Derivatives', International Journal of Advanced Biological and Biomedical Research, 1(2), pp. 186-196. Fahed Hamak, K. Synthesis,Characterization, Biological Evaluation and anti corrosion activity of some new bis-piperidone Derivatives. International Journal of Advanced Biological and Biomedical Research, 2013; 1(2): 186-196. Aseries of piperidine derivatives was synthesis by the reaction between substituted benzaldhyde ,pentanone-3,and ammonium acetate by refluxining for 1-2 hr in ethanol and the derivatives refluxed with (4,4'-Diaminodiphenyl sulphone) yielded bispiperidine ,the structures of the synthesized compounds were confirmed by spectroscopy analysis , The reported compounds were screened for their antibacterial activities against : Staphylococcus aureus, Klebsiella,Escherichia coli,pseudomonas aeruginosa,Salmonilla typhi, Enterobacter.The synthesized piperidone-4 were tested to determine their ability to inhibit corrosion of mild steel in 1mol.L-1 H2SO4 and measured by polarization measurements . Which showed that these compounds act as mixed-type inhibitors. The studies revealed that the nitrogen of Schiff base and sulfur atome ,piperidine moiety ,and the phenyl ring assist largely in corrosion control. 1.El-SubbaghHI,Abu-Zaid SM,Mahran MA,BadriaFA, Al- obaid AM (2000). Synthesis and biological evalution of certain α,β-unsaturated ketones and their corresponding fused pyridines as antiviral and cytotoxic agent ,J.Med Chem 43:2915. 2.JeromBR,SpencerKH (1988). N-Heterocyclic–N-(4-Piperidinyl) amides .Eur Pat Appl EP 277794 KatritzkyAR,FanWJ (1968) Anovel and versatile synthesis of1-alkyl-,1-aryl-1-(alkylamino)-,or1-amido-substituted and of 1,2,6-trisubsttituted piperidines from glutaraldehyde and primary amines or monosubstituted hydrazines .J Org Chem 55:3205 and references cited therein . 3.MobioIG,Soldatenkov AT,FederovVO,AgeevEA ,Sergeeva ND ,Lin S,Stashenku EE,Prostakov NS ,Andreeva EL (1989)Synthesisand physiological activity of 2,3,6- triaryl-4-oxo(hydroxyl, oximino,amino)piperidine .Khim FarmZh 23:421. 4.PerumalRV, Adiraj M,Shanmugapandiyan P (2001). Synthesis, analgesic and anti inflammatory evaluation of substityted 4-piperidones.Indian Drugs 38:156. 6.Raja.P.B.;Rahim,A.A. ;Osman ,H.;Awang,K,ActaPhysico Chimica Sinica 2010,26,2171. 7. Quraishi,M.A.;Sardar,R. ;Jamal ,D.Materials Chemistry and Physics ,2001,71,309. 13. Muralidharan, . ;Chandrasekar ,R.;Iyer,R.V.K.Proceedingsof Indian Academy of Sciences 2000,112,127. 14. Silverstei; Webster F., (1998). Spectroscopic Identification of organic compounds, John wiley & Sons, New York. 17. M.Abdallah,E.A.Helal,A.S.Fouda,Antipyimidine derivatives as inhibitors for corrosion of 1018 carbon steel in nitric acid solution ,Corros,48(2006)1639.